Expansion plans at an outdoor karting circuit backed by former Formula 1 world champion Nigel Mansell have been given planning permission – but only if they don’t stand out “like a lighthouse”. A new workshop, reception area, and visitor and race control facilities will be built in a new building next to the 750m outdoor racing track at the Dunkeswell Aerodrome. 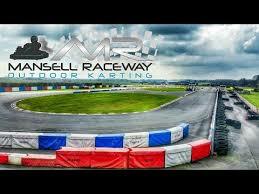 They will replace the existing portable cabins and outbuildings currently used by Mansell Raceway, and East Devon District Council planners had approved the scheme back in 2017. But they were forced to revise their application to move the building, rotate it 10 degrees towards the racetrack and to increase the height by 50cm after problems with the under structure were discovered. But councillors were told that there would an increase in the glazing on the first floor, facing south, meaning there would be an almost four-fold increase in the amount of windows. Ward councillor, Cllr Colin Brown, had recommended the plans be refused, saying ‘it will stand out like a lighthouse’. He added: “Last year the committee decided the building that was acceptable. This is totally different to that building. It would be very difficult to argue the situation of 18 inch taller making a difference to it, but the big difference is the windows. “It will end up with light spill in the open countryside. This is a building that is on top of the plateau and it will be stand out like a lighthouse any time it is being used with the lights on. “They say it won’t be used in darkness, but the operating hours are 9am-9pm, so part of the year will be in darkness. This building will stand out more than anything else and it will be occupied well into sunset and when it is dark outside. Kay Smith, Clerk to Dunkeswell Parish Council, also recommended that the plans be refused. Addressing the committee, she said that the proposal would increase light pollution and make the building more prominent. Chris Rose, the council’s planning officer, said that such a condition could technically be put in place, but it would have a large cost implication on the build. He instead said that if it was the difference between refusal and approval, a condition requiring details of a scheme to minimise light pollution from the proposed windows to be submitted to and approved in writing by planners in order to minimise the impact from light pollution on the AONB. Councillors voted by 13 votes to one abstention, that subject to lighting mitigation being approved, the plans should be approved. A workshop/storage, reception, visitor and race control facilities in place of portacabins and other outbuildings will be built on the site.